An outdoor wedding demands scenic pictures that capture the backdrop of natural beauty. Even indoor weddings can feature a few outdoor photos by posing the wedding party in a picturesque setting. Spring and summer weddings are the perfect time to highlight stunning flowers in a garden or park. The colorful blooms add a romantic atmosphere to an otherwise traditional kissing pose. Make sure your photographer knows you want to include shots that highlight the scenery around you when taking wedding photos outside. Skip close-ups and instead, use trees, water and rocks to frame your photograph. Just because you get married on a rainy or snowy day doesn't mean you can't take great outdoor photographs. Slip outside to snap a few photos under an umbrella during a light drizzle or with a wrap on a chilly day. Most photographers take pictures of the bride and groom entering and exiting their getaway vehicle. If you have the room, put a unique perspective on this traditional pose by photographing the vehicle in motion from a different angle, such as above or to the side. 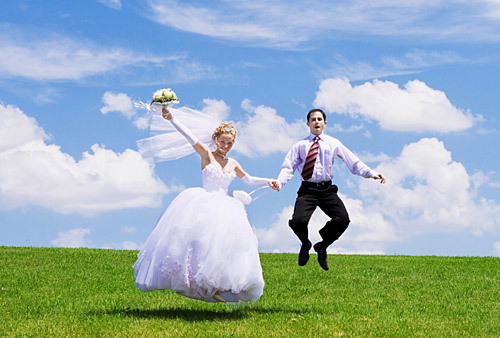 Let loose and have some fun outside after the traditional family and bridal party poses are finished inside. Procure some bicycles, blow bubbles or swing on a children's playset for some carefree photographs. Even if your wedding location isn't the most picturesque, you can still take a few snapshots outside. Try getting a few on the steps of your ceremony venue or near the entrance of your reception location. The right outdoor lighting can create stunning effects. Have the photographer pose you so that your bodies or faces are lit by the natural sunlight. A soft glow effect and natural highlights will look beautiful in print. Evening weddings are the perfect time to get a great shot at sunset. While this is a favorite pose at beach weddings, it can be used anywhere the sunset is easily seen. If the groom is a construction foreman or the bride is an amateur tennis athlete, it only makes sense to include those interests in outdoor wedding pictures. Make sure the photographer knows you need to travel to a specific location, and get permisison beforehand, so that you are sure to get all the shots you want. Just because you are getting married in an urban environment doesn't mean you can't have some great outdoor shots. Try getting a photo on a rooftop or from a tourist area for a cityscape in the background, or get photos near walls with grafitti for a more gritty, artsy look to your pictures. When taking outdoor wedding pictures, it is important to take your time. Snapping in between poses and while walking from location to location often results in just as good shots as any perfected pose. From playful to traditional, there are plenty of outdoor ideas for you to incorporate into your photography wish list on your wedding day.